Some time ago, I discovered the wonderful blog of artist Sharon Kallis. I think it was one of those moments of serendipity that the world wide web enables so marvellously–she stopped by this blog having found a post about processing nettle fibre (unsuccessfully, I might add) and left a trace of some sort–like a kind comment–and I wondered what she was writing about and went to find out. Her blog is a trove of inspiring writing and action. She is part of a multitude of projects I find really exciting–when I first found her blog, she was using basketry techniques with weedy species to control erosion, raise consciousness about weeds, and build community. Since then, she has been involved in community gardening projects, including communally growing and processing flax to make linen. 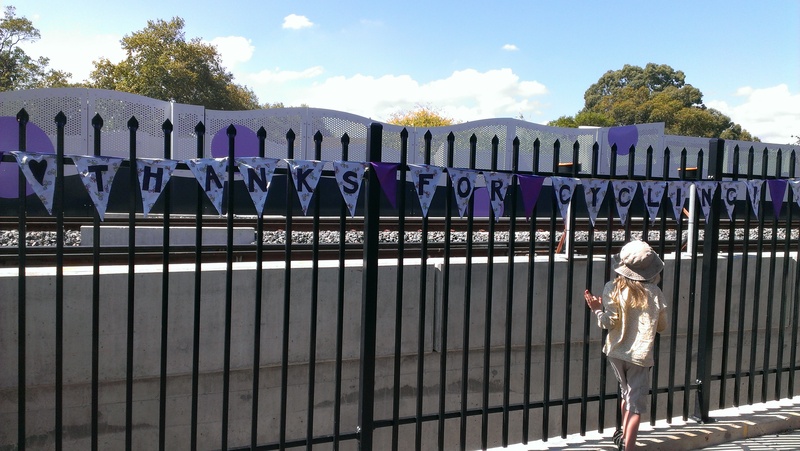 She has been working with parks using what would otherwise be waste vegetation or prunings for basketry, dyeing, sculpture and other community projects. She is spreading awareness about bees and building bee habitats in the suburbs. And so on. Many of these projects have educational, celebratory, musical and film aspects that make them all the richer and more exciting. Imagine my delight when I realised that she was writing a book! 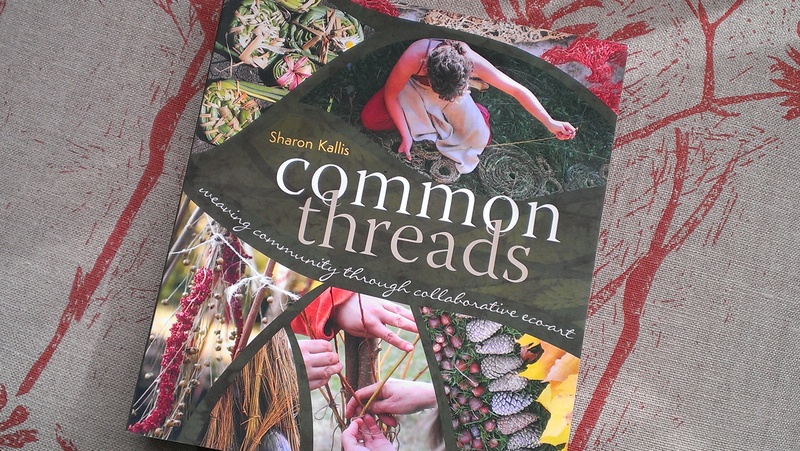 I pre-ordered Common Threads (New Society Publishers, 2014) and was so utterly delighted by it I remember wondering if it was possible I could quit my life-eating (though in many respects wonderful) day job and take up community art instead. Somehow months have passed without my writing a review. But here it is at last. 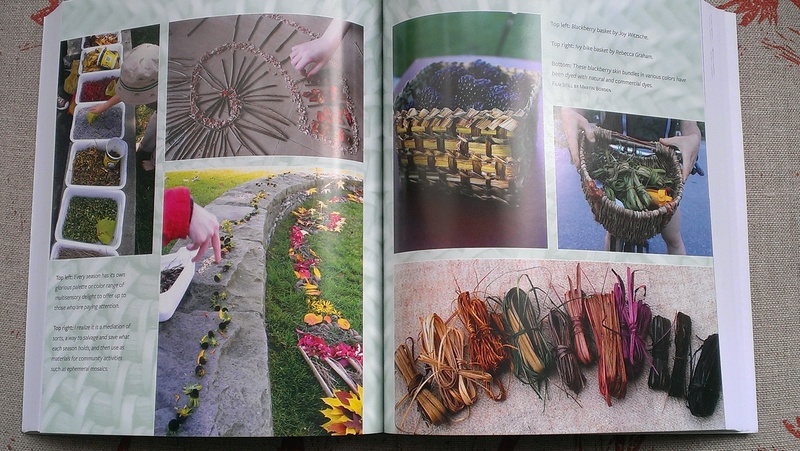 The book is rich in sources of inspiration, full of ideas, imagination, interviews with other community and eco-artists whose work inspires and informs. It is divided into three sections: Places, People and Plants. In Places, Sharon writes about the imperative to use what is local, including what is invasive and weedy in a local landscape. In relation to weeds, her approach centres on problem solving from the troublesome features of invasive species toward using them as resources for sustainability. The projects featured engage members of the community in learning about invasive species as well as learning basketry and stitching techniques to work with plants. She writes about building change with other members of the community, introducing the concept of ‘backsourcing’: ‘the process of re-claiming what we outsourced when factories took over the production of goods to satisfy the general needs of a developed country’s population.’ Her case studies include the Means of Production Garden, a community garden in which artists grow the plants needed for their art practices; and the Aberthau project in which people grew their own flax in community gardens and household plots and then learned to process it into fibre, thread and eventually, garments. The People section deals with strategies and processes for building community through engagement with the plant world and the process of growing, harvesting, making and celebrating the seasons. The final section on Plants provides a wealth of practical information for working with invasive species (many are recognisable in Australia even though Sharon is working in Canada). It then moves on to techniques for basic basketry, netting and string making. 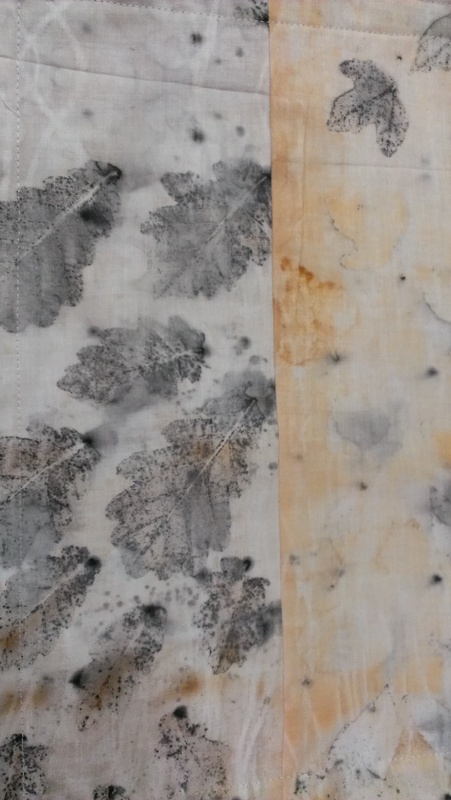 The basics of plant dyeing are covered, and the section concludes with the logistics of managing green waste as a source for community projects, accessing funding and partnering with public parks. I am in awe of the reach of this book–all the way from how to turn leaves into string through to how to organise large scale projects utilising the green waste from parks and managing relationships between artists and community workers and public sector authorities. 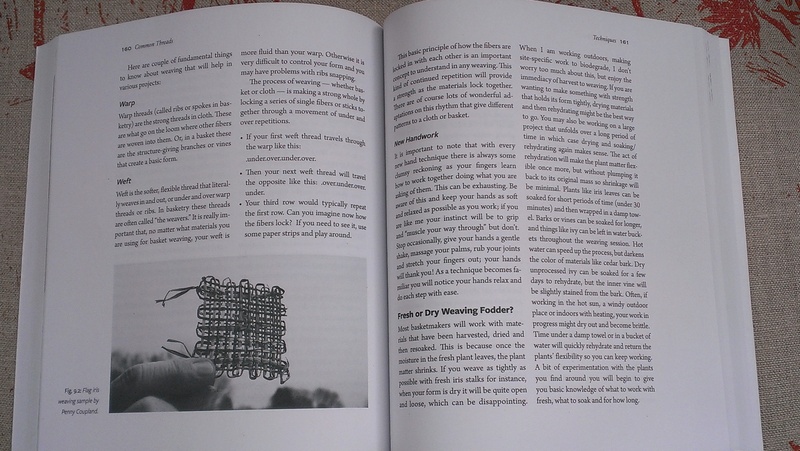 Each section of the book includes interviews with other artists involved in organising the featured community art projects. I loved these insights into the how and why of these projects. I have my own sense of why these projects might be valuable and interesting, but inevitably other people’s sense of the importance of the local, the environment, and making are diverse and wonderful. I found lots of resonance with ideas and processes that I use in my own small way—but such a profound sense of building community and of building up strategies for change and engagement made vivid and visible. As the chapters unfold, a critique of consumption and materialism builds up. A sense of the value of all that is impermanent and biodegradable in the face of a society that is structured to require and encourage consumption and which creates disposable packaging that can last for centuries develops. And a sense of what might be done to address these questions opens up. After the recent massive vat dyeing project, and with so many Eucalyptus Cinerea leaves lying around drying slowly, I was itching to dye some bundles. After a full day of mordanting and dyeing and sewing in windy overcast weather… here’s the view over the back fence and up into the sky. I had a piece of silk twill left when one of my workshop participants didn’t appear. In it went. I also had a linen shirt and a cotton t shirt sourced at op shops and ready for renewal that I had mordanted in summer. By the time I tied those bundles the sun was setting. I filled the pot with madder exhaust, and topped it up with some of my very-much reused alum pot. As the remains of the madder rose up the fabric and the temperature rose, the sun went down. 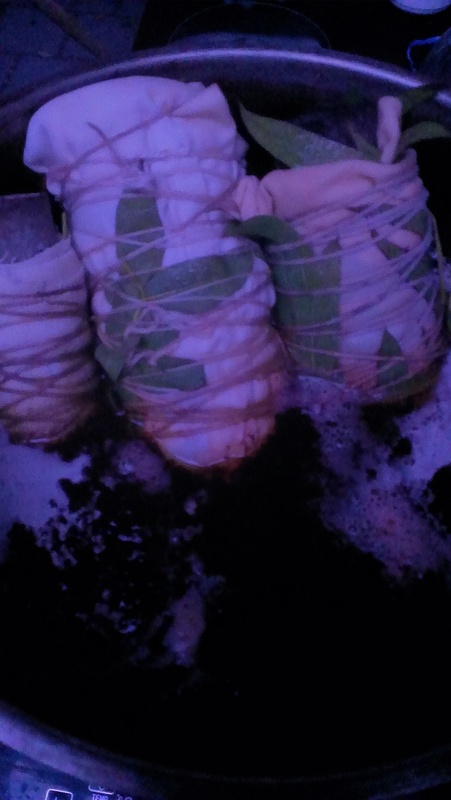 When I opened these first two bundles the impact of the chalk in the madder pot became clear. And despite having allowed the leaves to dry for days, it is midwinter here. 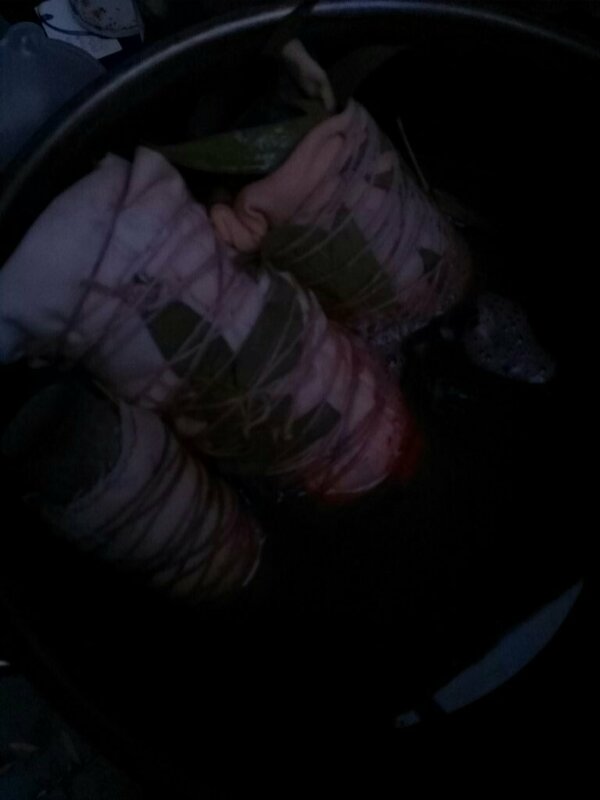 Those leaves would have started out full of water, and they are drying very slowly. 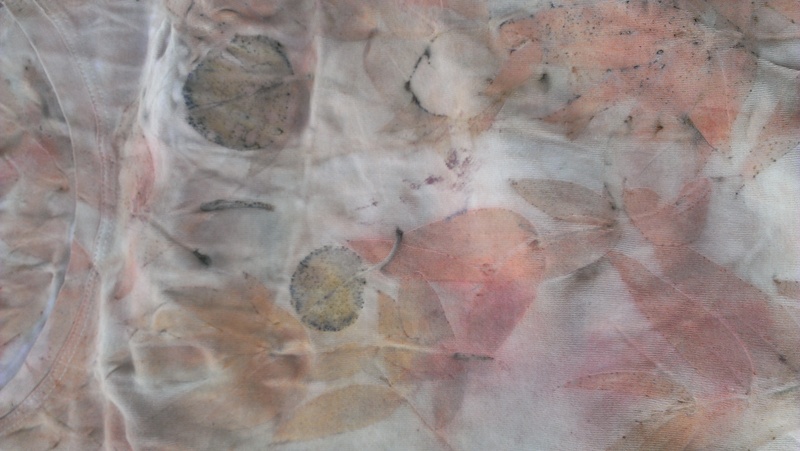 Interesting results… This is the silk twill. The round green shapes are from dried E Cladocalyx ‘Vintage Red’ leaves. This is the t shirt. Here is the part of the t-shirt bundle that was in the madder exhaust/alum blend. So little colour from the E Cinerea! 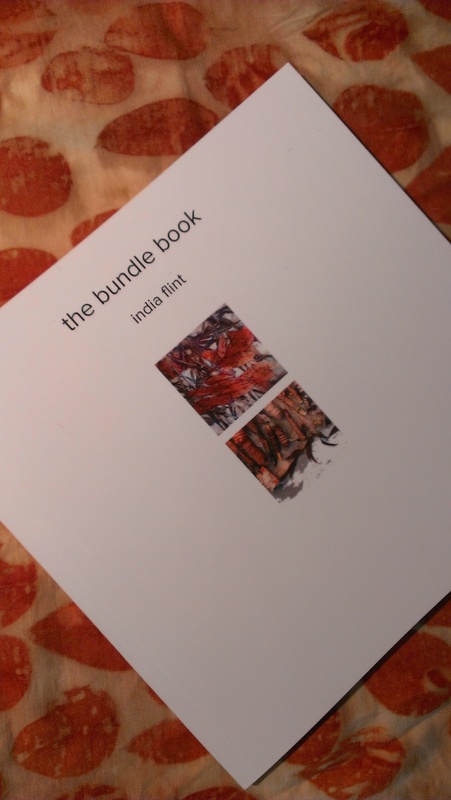 If you wish you could try this method and have experiments of your own and bundles to untie at your place–but you’re not sure where to start, India Flint has just published ‘the bundle book’. It is a concise introduction to her technique on fabrics and on paper. You can see an extensive preview if you follow the link. This book is unspeakably cute–being both small and exquisitely illustrated with photos to inspire. It presents information about techniques (such as dyeing paper) not covered in her earlier books, strategies for sustainable and safe dyeing and a history of the eco-print method. It also addresses fresh ideas developed since the publication of Eco Colour and Second Skin. And, it is full of India Flint’s inimitable voice. I am old enough to remember when recipe books were sold on the basis of recipes and not celebrity cooks, and when the writing was bland and spreadable. I don’t miss the bland and spreadable writing, though I’m less sure about the cult of celebrity cooks. No danger of bland here! 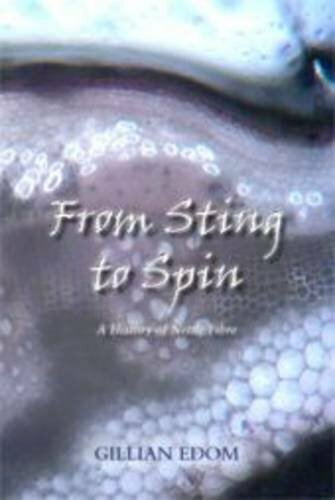 I very much enjoy the sense of a unique intelligence at work on subject matter I think about a lot that is a feature of India Flint’s writing. 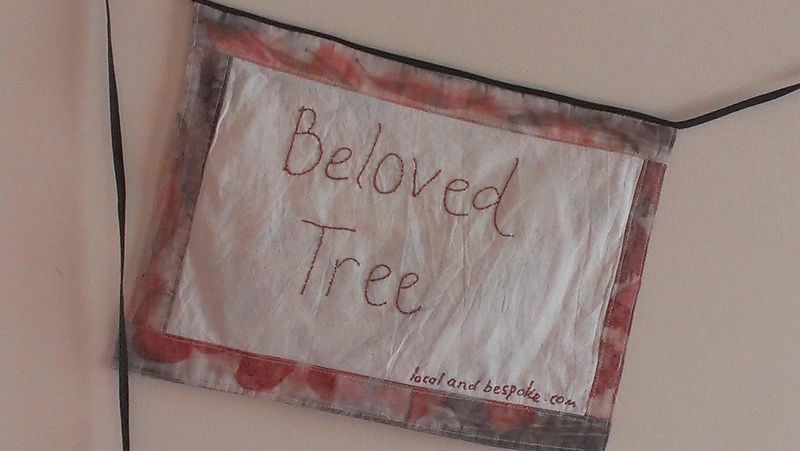 It is a rich addition to her insights and strategies about harvest, recycling and dyeing. This book is published on demand, which is a no waste, effective way of publishing a book for something short of a mass market. I suspect it also means that the book you order in Australia is printed here, but a book ordered in North America will be printed there, and not have to travel the seas or skies to reach you. The printed versions of the book are fairly expensive, however. If your wallet is up for it, it’s a great way to support an independent artist and the end product is delectable. If your wallet isn’t up for it, the downloadable pdf option is instant and very affordable, and still a great way to support an independent artist. There have been some small moments of crafty completion in the recent period of day job overwork. 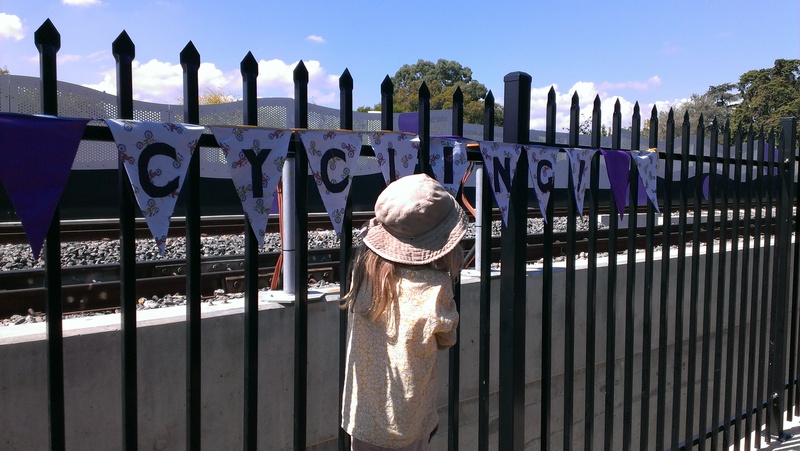 The ‘thanks for cycling!’ bunting, which had been ripped down, was replaced after mending by a group of friends one sunny afternoon. Proper attention was paid to all its hanging particulars by willing fingers…. 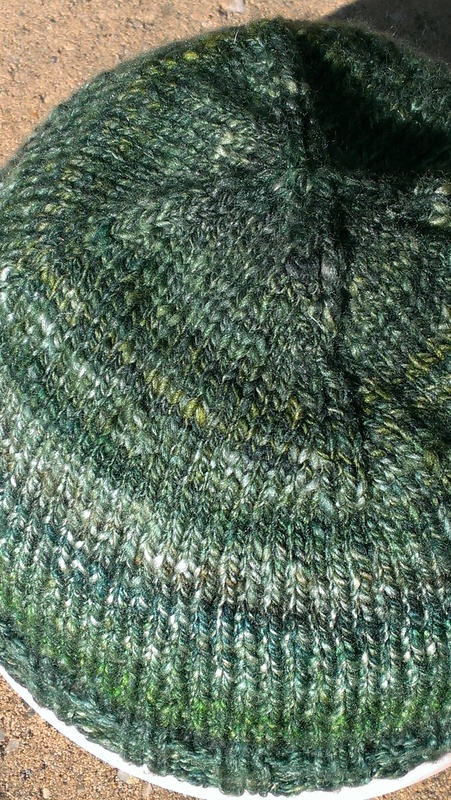 And there has been still another Turn A Square made from the remainder of a skein of luscious handspun yarn. Here it is, modelled by a particularly willing bowl. 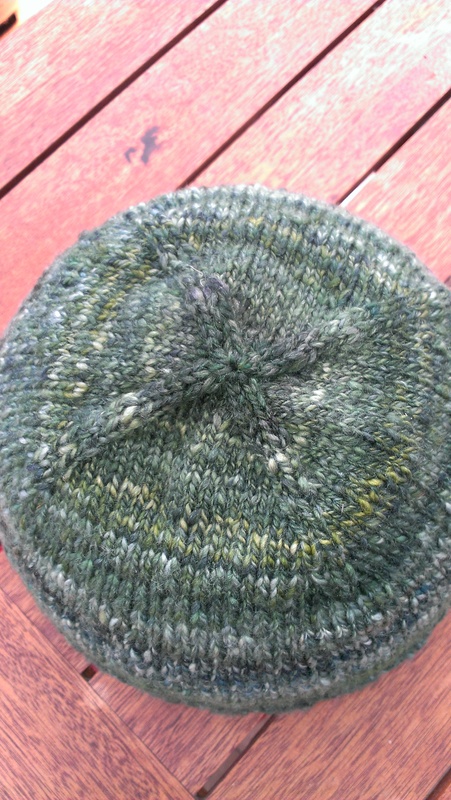 The distinctive crown shaping of this pattern is so simple, yet so effective. Upcoming public holidays may prove more viable crafting time than recent weeks have done… and I am looking forward to it! I have plans! While I was in Melbourne, I found Sarah Corbett’s A Little Book of Craftivism. Yes, it is literally small, but inspiring out of proportion to its size. It is about the work of the craftivist collective, together with proposals about how the reader might engage in their own craftivism. For those who might be wondering… one definition of craftivism: ‘Craftivism is a way of looking at life where voicing opinions through creativity makes your voice stronger, your compassion deeper & your quest for justice more infinite.’ More at the link. I loved this little book from the beginning. This is activism of a gentle, slow kind. It isn’t the only kind of activism the world needs. But every social movement needs a variety of approaches–I’ve participated in many–and gentle is one of them. This book is packed with organising wisdom, clear instruction, pictures that inspire and make you wish you had been there and examples of projects from the small to the enormous that offer plenty of scope for DIY. For a view of the book and its content, click here. For a brief review with links to multiple other reviews and ways to purchase online other than through amazon, click here. To purchase from the craftvist collective itself, click here and check the sidebar. Did I mention finding this book inspiring? I think it’s one of the highest compliments that you could pay to a book of its kind to say that I immediately wanted to go out and make some of the projects in this book and could immediately see places that could happen to good effect. Not only that, I tried my ideas out on my nearest and dearest and then created them. My ‘mini protest banner’ is a little different to the cross stitched versions in the book–but nevertheless the same concept. Before long I had made two banners. We hung the first one today. One of my friends offered the view that every day was a good day for this kind of event (I guess we’re friends in part because we agree on things like that!) 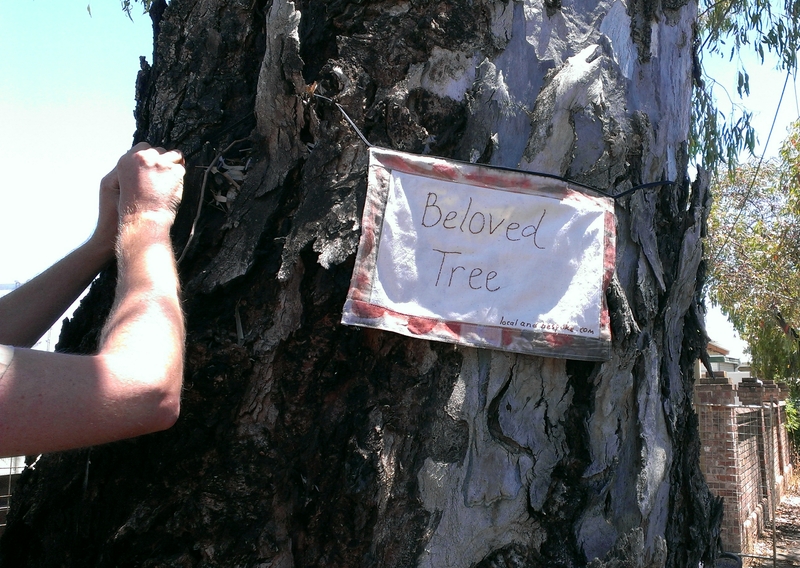 so we had cool drinks of water and cherries and chat and then went out to admire the tree and tie on. 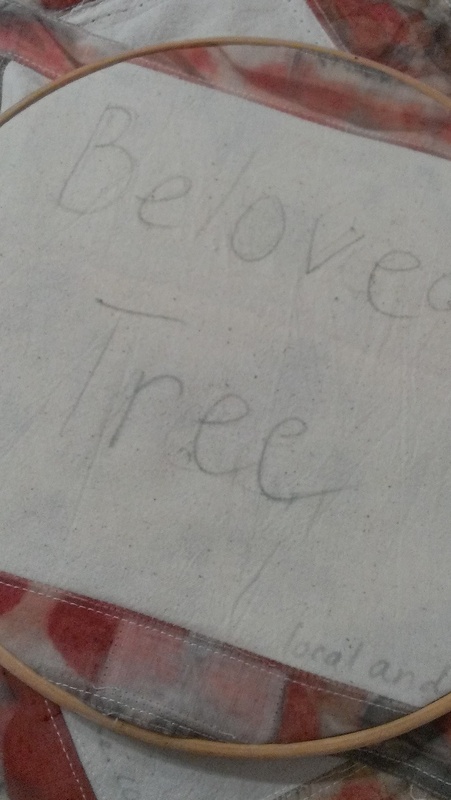 The 6 year old present wants to make more banners, which is additionally promising. 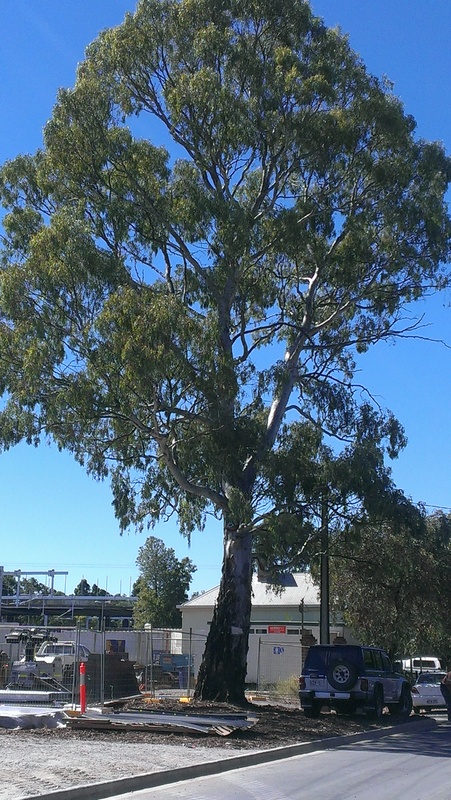 This banner celebrates a river red gum (E Camaldulensis) that we managed to save from being cut down last year, with help from other local people and our local MP, Steph Key. It has a legally mandated 3 m exclusion zone around it to protect the root zone, but this is not being observed very well lately and I want the people responsible to know that we care. I had to measure the tree to be sure I had stitched on enough tape: 3.6 m (11′ 9”) around the trunk, well above the ground. To give you a sense of its size… and the relative size of the banner (which is in the picture), I give you the full view.